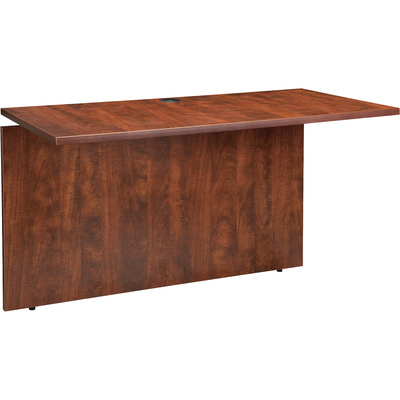 Bridge Attaches To Any Desk Or Credenza In The Lorell Ascent Series Laminate Furniture, Which Offers Contemporary-Style Laminate And Raised, 1" Thick Floating Tops. Cherry Laminate Surface And Side Panels Are Built For Durability And Are Stain-Resistant And Scratch-Resistant. The Top Is Supported By Aluminum Brackets To Provide The Floating Appearance. Use The Grommet Hole In The Top For Easy Cord Routing. Design Also Includes 3mm Pvc Edges (Color-Matched) And Adjustable Floor Glides For Stabilization..
Bridge Attaches To Any Desk Or Credenza In The Lorell Ascent Series Laminate Furniture, Which Offers Contemporary-Style Laminate And Raised, 1" Thick Floating Tops. Cherry Laminate Surface And Side Panels Are Built For Durability And Are Stain-Resistant And Scratch-Resistant. The Top Is Supported By Aluminum Brackets To Provide The Floating Appearance. Use The Grommet Hole In The Top For Easy Cord Routing. Design Also Includes 3mm Pvc Edges (Color-Matched) And Adjustable Floor Glides For Stabilization.